Well, that's it. This final Test is very finely poised but South Africa will feel they just about have their noses in front. England, however, will be very confident of making inroads with the new ball in the morning and putting themselves in a winning position. Join us tomorrow to see how it pans out. Until then, goodbye. "Very definitely South Africa. England's bowling was flat - woeful - this morning and not that much better this afternoon. South Africa made hay bit in the evening." "When the new ball was taken I am afraid whatever we tried we were just too short. "Bavuma looked fantastic - he hits his off drives crisply - and we bowled too short at De Kock. They got 46 off the 10 with new ball so they finished the day in South Africa’s favour." Greg Russell: Whilst SA team may not be a classic it's not a shocker. De Villiers, Amla, Morkel surely all considered greats. Great series win. "De Villiers is the best in the world but when you first get in got to play yourself in. If you can bowl it in that channel you get people out. Broad got him fiddling outside off stump but we didn’t bowl it there often enough." Ian Shepherd: Honours even so far. England have responded well.. Need 2 knock em over for 400 or less. "His footwork was immaculate, absolutely gorgeous. He got right back and what you have to with the short ball is get high and keep it down. "His shots were nice touch shots. He just played nice cricket and I thought, 'Wow, where has he been?' They have airy fairy opening batsmen in but where has he been? For 90 runs he looked an excellent opening batsmen." Ian Bradley: Evidence mounting, England have an Anderson shaped hole to fill before the next Ashes series. Ian Joyce: Why we haven't given others a game is beyond me. "Woakes does his best but there's a bit missing - he's steady, has got a nice action and moves the ball a little bit. But as a batsman there's nothing to worry about - he's a fill-in. There's a little nip missing to make him a really good Test bowler." England batsman Joe Root on Sky Sports: "We weren't quite at our absolute best, but I thought the way we applied ourselves in the last two hours was a great effort. I wouldn't say we lacked intensity, but sometimes you can have a bad day. "South Africa played well, but when you get behind the game, the important thing is how you react and we reacted well. James Taylor is a freak and if he keeps taking them like that he'll get a reputation as the best in the world." "Jimmy Anderson looked very ordinary. He had no pace, no nip. I don’t think he needs a break; he needs lots of bowling. He looks so rusty and unfortunately he gave that impression with body language." Stephen Cook, who made 115 on his South Africa debut, on Sky Sports: "I didn't feel too much different this morning - I was relatively calm. I'm a fairly level-headed guy. But there was an extra twinkle." "There were a couple of nervous moments in the 90s. There was a referral on 98 - I have never been so nervous in my life. I though, 'I've waited for so long to be here, but if I had to wait for another hour so, I'll do that'." On his century: "There wasn't a lot going through my mind. I was really happy to go and make three figures - to finally cross over." "England looked out of the game at tea but they came out after and started to pressurise both batsmen with off-side fields, bowling wider and wider. Stokes and Broad bowled particularly well and make it very difficult for them to score. "Amla got out through the short stuff. He didn't get right forward to Stokes and he nicked it on to his stumps. Stokes made something happen when they were in difficulty. "The lad played really well for 90 runs - he looked an excellent opening batsman. The nervous nineties got to him." Former South Africa batsman Jimmy Cook, father of Stephen Cook, on Sky Sports: "I couldn't be prouder, he's put in so much dedication and hard work. I was due to go to Dubai but my younger son cancelled my ticket. "He's stuck to the way he plays and I was pleased to see him go up a level and do well. He couldn't have asked for a better partner than Hashim. I always encouraged to keep persevering. "I always encouraged him to play overseas but he wanted to stay and play for South Africa. I thought it might never happen for him but he never gave up hope." So, a see-sawing first day but South Africa will feel they just about have their noses in front having won the toss and chosen to bat. The hosts were dominant in the first two sessions, with debutant Stephen Cook and Hashim Amla both posting superb hundreds. England's bowling was lacklustre, and their fielding was mixed - with James Taylor taking a blinder at short leg to dismiss Dean Elgar but Cook and Amla both missed at slip. But the tourists fought back in the evening session to reduce South Africa from 237-1 to 273-5, with Ben Stokes, Stuart Broad, Chris Woakes and Moeen Ali taking a wicket apiece before De Kock and Bavuma's late cameo. "A pretty hard day out there for England. Not quite a day of two halves, but for two thirds of the day I thought England were below par." Ben Stokes is given the ball for the last over of the day. But it's South Africa who are finishing this topsy-turvy day with their hand on the tiller, and Bavuma has the final word by square-driving for four. That's stumps. "It has been a really enjoyable day's cricket. It is always nice when someone comes in and does well in their first Test." Bavuma knocks a single and that brings up a rapido 50 partnership between these two. Just when England seemed to have the momentum, these two young thrusters have pinched it. "That’s an exquisite shot, he really does play that well. There was a bit of Tendulkar about that." Bavuma keeps the momentum flowing South Africa's way with a brace of fours. The first is brutal, crunched down the ground; the second is pure eye candy: getting his foot to the pitch of the ball and unfurling a velvety drive through the covers. So good-looking you could pin it to a teenager's bedroom wall. Greg: With the new ball in their hands our bowlers have lost their heads. Poor bowling. De Kock puts the hammer down! The cherubic stroke-maker is getting his ODI groove on. He takes Jimmy Anderson for a trio of fours: punching down the ground, slashing off the back foot and then clobbering a pull over midwicket. This partnership, in no time at all, has accumulated 40. News from elsewhere in the cricket world: Elton Chigumbura has stepped down as Zimbabwe captain in all forms of the game. The 29-year-old all-rounder has captained Zimbabwe in 62 of his 196 ODIs and 18 of his 41 Twenty20s. Although he has been Test captain since Brendon Taylor quit internationals after the 2015 World Cup, he has not led the side because Zimbabwe have not played a Test since November 2014. Chigumbura said: "I still believe I have more years of playing in me and of winning games for the team." De Kock clips Broad into the leg side for a single. Meanwhile, up on the balcony, Jimmy Cook - father of Stephen - has cracked open the bubbly. "England need another wicket to make it a comparable day. They gave them a 100-plus start before they have clawed it back a bit." What do you reckon - are we having that from De Kock? How do you hurt yourself walking the dog exactly? It sounds like one of those excuses you'd make your mum write in a note if you wanted to get out of games. Has anyone from Cricket SA checked what he was up to during the third Test? He's back now though, and announcing himself to Stuart Broad with a crunching pull through the leg side for four. "Anything under 400 will be a massive disappointment to South Africa. After lunch, England would have said if we could bowl them out for under 400 then we have done a fantastic job." Quinton de Kock, you may recall, missed the last Test with one of the more bizarre excuses in cricket history - he apparently hurt himself walking the dog. It's just as well Dane Vilas didn't make a hundred in his absence - he might have stubbed his toe kicking the poor mutt. De Kock defends to mid-on for a single. Charlie Latto: In the space of a day we've gone from being a great team, to having an awful bowling attack, back to being pretty good again. Whoah there, some absolutely prodigious movement from Stuart Broad, wide and De Kock can't resist a dart - he's lucky not to snick as it curves into the hands of first slip. The average first innings total at Centurion, I'm told, is 350, which makes this pretty much a par effort by South Africa so far. Mind you, there's work to do yet to get up to that total. "It is a big moment for England. If they can nick a couple here, and get them seven down, they can go to bed thinking, 'we can have a big lead here'." Yes, unsurprisingly, the new ball is taken straight away, and entrusted to the craftsmanship of Jimmy Anderson. Plenty of shape for the Lancashire seamer early doors, but Bavuma responds with some geometry of his own, pinging a four straight through point. England's Sarah Taylor says her game will improve enormously from her experience of playing men's cricket in Australia. The wicketkeeper-batter made history in October by becoming the first woman to play Australian first-grade cricket, appearing in two matches for Adelaide's Northern Districts under the captaincy of Australia batsman Mark Cosgrove. Taylor told BBC Sport: "It was intense, probably one of the best experiences of my life. "The guys were absolutely brilliant. It was the hardest thing I've done on a cricket field, but equally as rewarding." England's Sarah Taylor believes her own game will improve enormously from her experience of playing men's cricket in Australia. Moeen with what you'd imagine will be the final over with the old ball. The new cherry rests, primed like a red leather grenade, in the hands of the fourth umpire. De Kock works a couple off his hips. Tom Littlewood: The pendulum is swinging now, all out for 340 would be fantastic for England. Luke Swales: We need this lot 6 down by close to have any chance of a win. Jay: SA doing a decent job of trying to emulate India's dramatic collapse from a few days back. Glorious from Bavuma - yet another four-ball in a very ordinary day from Woakes and it gets the treatment, carved through backward point for four. "This game has taken a sea change since the interval." So, Quinton de Kock comes to the party. He's immediately off the mark, but make no mistake, England have fought their way back to parity in this match, especially with four genuine tail-enders to come. Has that leaky outfield proved a bit of a turning point? "Oh dear. It’s a short ball, it may have scuttled a little low. It looked plump from here. Duminy will be devastated." Oh JP, what have you done son? Horrible, horrible moment for the newly recalled batsman, desperate to finally stamp his place in this side, as he aims a wild pull at a Moeen delivery that keeps low and hits him right in front of the stumps. The umpire's finger goes up, and this is suddenly looking like an even day. Bavuma gets off the mark with a drive into a gap for two. A bit of a mix-up with the running almost gets him in trouble, but he's OK.
"England have pulled themselves right back into this game. They have managed to bring the run rate down and have picked up three wickets." A good, tight over from Moeen keeps the pressure on South Africa. "From that first ball, when he got a leg stump half volley from Jimmy Anderson, Cook just looked like he knew his game." Temba Bavuma is the new man and all of a sudden England are right in this Test match. New ball, De Kock the next man, one wicket away from the tail after that. "It doesn't matter how you get them but somehow, from the middle of nowhere, Woakes has a wicket without anything special." Gone! Stephen Cook's brilliant innings is finally over, Woakes offering a tempter outside off and the opener has a flash and gets an inside edge onto the timbers. He looks absolutely gutted for a man who has just made a hundred on Test debut - a sign of a man with serious appetite for big runs. Big wicket for Woakes, who has bowled poorly today but will be geed by that scalp. Another freebie from Moeen - dragged down and begging to be hit. Duminy - who has been given a bit of a jump start by England - obliges by pasting it through midwicket. Streaky from Cook, outside-edged past Joe Root at gully for four. Anderson has got the double-teapot on, but he has only himself to blame for the next boundary, on Duminy's pads and flicked away for four. "That was absolutely horrendous - a horrible waist-high full toss. It just slipped out of Moeen’s hand." "Duminy has got a real problem against off-spin." Change-up after drinks - Moeen Ali to bowl to some off-spin, and his first ball is an absolute doozy: bit of drift in, and sharp turn past the outside edge of Duminy. Still, as seasoned observers of Moeen will know, as sure as night follows day, a bad ball will follow his good one. Sure enough, a rank beamer slips out of the hand and is dispatched to the boundary by Duminy. "The pitch might get a bit quicker tomorrow. That is why South Africa have to make it count - they need to get 400 on here." Is it just me, or when commentators talk about bowlers 'slipping themselves', does anyone else think they've done themselves an injury? Sounds painful to me. Anyway, Anderson sends down a maiden to Cook, and it's time for drinks. "South Africa have got to be positive and make sure the scoreboard keeps ticking on. If you add two wickets to the score now, it is a good turnaround from where it was." Duminy - who is coming off an unbeaten 260 in South African first-class cricket - gets off the mark with a bash through the covers for four. "They have just bowled better areas in the session. They have been more consistent and they have bowled into the surface. Broad has been the stand-out." Cook blocks out a maiden to Anderson. "Cook has looked the part today, he really has." It would be fair to say that getting a debut hundred isn't exactly a guarantee of future success. Adrian Barath, Hamish Rutherford and Stiaan van Zyl are some of the less illustrious recent names on the list. But Cook really has looked the real deal. He punches one through the covers, Duminy remains stuck on nought. Karl Reynolds: Surely I'm not the only one that noticed it's a century of debut century makers and it's come at Centurion? Cook, now loosened up, flays a four through midwicket on the pull. Meanwhile, up the other end, the new man is JP Duminy, who is back in the side after being dropped mid-series and then making a double ton for his franchise side. He blocks out his first two balls. So, Stephen Cook becomes the 100th man to score a hundred on Test debut, and the fourth-oldest. Brilliant achievement. Could he enjoy a Chris Rogers-style Indian summer in the Test side? We shall see. "A tremendous effort. The pressure that was on him at the end. Well, well, well what can you say? Well Done Stephen Cook." "That was splendid. He played beautifully up to 90 then it was agonising. It just shows that so much of the game is in the head." He's done it! What a great moment for Stephen Cook, an hour in the 90s but finally the 33-year-old who thought his chance would never come gets one on his pads and glances it into the leg side for two. The boyhood dream is finally realised. Lovely scenes in the stands as three generations of the Cook family - father Jimmy, and Stephen's wife and daughter - join in the rapturous applause. Well played sir. "I think it's going to be hitting part of the stump. He'll get away with it." "AB de Villiers is walking off briskly like someone who knows he has got to walk the plank." And another! Get one, get two, they always say, and that maxim holds true for England. Bouncy outside off stump from Broad, AB can't resist a fidget at it, and he ends up fending a sharp catch to a flying Joe Root at second slip. England back in the game! "What a formidable achievement from a really great batsman." Still, it was an absolutely superb innings from Amla - full of his trademark gossamer-wristed cover drives. He is now the leading run-scorer in this series, just ahead of the man who dismissed him. AB de Villiers the new man. "Stokes earned that wicket. He bowled sharp and a lot of short balls at both batsmen. They have had to stay back and not push forward. That was a good length; he has not got out of the crease." What do we always say about Ben Stokes? He makes things happen. Case in point here: England looking flat as a pancake, and suddenly the strawberry-blond talisman breaks through with a good delivery which clatters the stumps via Hashim Amla's inside edge. Breakthrough. Francis Edwards: Big weakness for England, cannot bowl when it's not swinging and cannot bowl on spinning pitches. Major concern for future. Hashim Amla is flowing like a burst water main at the moment. He's in full torrent. Stuart Broad serves one up outside off stump and he flays it through the covers for a four that brings up the 200 partnership. What a superb stand it's been from these two. Right, the Bridezilla. So I was having lunch and the woman sitting at the table next to me was obviously on some sort of pre-wedding reconnaissance outing with a couple of friends. "I never thought I'd be one of those nightmare brides," she said. "But ultimately, this is a project and I'm the co-ordinator. Someone's got to make sure stuff gets done." Except she didn't say stuff. Test cricket: apparently not the only activity that demands all-white dress and military precision. "Umpires send everything upstairs these days. That is the one problem with the DRS system." He's fine. He moves on to 96. We've got a run-out review here, but I'm pretty sure Stephen Cook is home comfortably. "They are making him work pretty hard but he is a patient guy. He knows his game well, he will be prepared to wait a long time for his first Test hundred." Cook, inching his way towards the target, retains the strike with a dropped single into the leg side. You'd imagine he'll be thinking of getting there in ones at the moment. But who knows? After all, this is the universe where Nick Compton got out trying to win a match with a six. All things are possible. "This could be an interesting session. South Africa at the moment are in a dominant position. The rate is just over four an over. Maybe there is an opportunity for these two to press on a bit." Email Message: Stephen Cook is in the nervous 90s. Let us console ourselves that he was once out for 390 in a first-class match – so there is a possibility of four phases of nervous 90s. Stephen Cook is in the nervous 90s. Let us console ourselves that he was once out for 390 in a first-class match – so there is a possibility of four phases of nervous 90s. Oooh, heart-in-mouth moment for Stephen Cook. He pokes to cover and sets off for a very sharp single. Broad whizzes a throw past the timbers and Cook's rueful smile tells you he was well short if that had hit. "Broad is looking like he is having a long day already. His knees are not really kicking up at the moment." So, Stuart Broad gets us going after tea. Immediately he draws the edge of Amla but the ball drops agonisingly short of Cook at first slip. "Oh you're joking," says Broad in disgust. Deadly serious I'm afraid Stu. "I am not sure who spotted it in the first place because it is not like a geyser - it was just bubbling up to the surface." "People are looking on bemused there is no announcement anywhere. This is where cricket lets down the viewer." "An irrigation pipe has burst. There's various men out there in big boots out there. What a shame Andy Caddick isn't playing, he could turn his hand to anything. We need a plumber." "It's a strange one. We badly need water in this country, yet we've got water on the field." Disappointingly, we don't have a specialist graphic for this. But yes, incredibly, it appears that some sort of pipe has burst beneath the playing surface and brownish water is now oozing onto the outfield. James Gheerbrant's pre-evening session sprint to the chair beside me is becoming something of a live text tradition. He's here to talk you through the rest of the day, possibly with some chat of a Bridezilla. Enjoy. "England have given them a 220-run lead. Can they fight back and win? If they can't win, can they fight back to draw like South Africa did at Cape Town? There's a lot to play for some of these players." To remind you, Test Match Special will be talking to Ian Bell during the tea break. Bell was appointed Warwickshire captain yesterday, but he insists he still wants to return to the England team. Have a listen. "England tried to bowl the golden ball all morning instead of bowling with patience. There have been dropped chances and a few fumbles in the field..."
"Another session won emphatically by South Africa." That's the break. Ben Stokes pounds the whole of the last over into the deck, with Amla happy to get out of the way. At tea, South Africa are bossing proceedings. England have been pretty woeful. A slight victory for England - South Africa's run-rate has dipped below four an over. A touch of spin before the break, with Moeen accurate enough to probably prevent Cook from reaching three figures before tea. Maybe only one over before the players head for a brew and a biscuit. I didn't spot it myself, but I'm told that James Anderson has been warned for running on the pitch. He was taken out of the attack for just that offence in Johannesburg. Ben Stokes comes on for Anderson, now with just one slip in place. A few bumpers, Amla ducking and swaying to get out of the way. "It's Amla's fourth-quickest hundred, his fifth at Centurion and his sixth against England." Just remember, though, Hashim Amla was dropped on five. England's bowling has been pretty poor, but how much of a boost might that wicket have given them? The same goes for the life given to Stephen Cook. Speaking of Cook, attention now turns to his hunt for a ton on debut. Will he get there before tea? There's about 10 minutes before the break. "Amla has batted so fluently. It's been a controlled innings, yet aggressive." What a fantastic innings from Hashim Amla, who has been released from the shackles of the captaincy and is batting beautifully. A feature has been the cover drives - wonderful stroke after wonderful stroke. So easy on the eye. He brings up a 25th Test ton with a single to mid-on, giving Centurion the excuse to erupt. "The bowling has been very very average. Only one spell by Stuart Broad has been any good." As the Barmies sing, England are just about managing to string together a couple of quiet overs. Hang on, I spoke too soon. Too short from Woakes, Stephen Cook on it in a flash to pull through mid-on for four. Alastair Cook once again puts his head in hands. I don't think it's an exaggeration to say that we could be witnessing the end of Chris Woakes' Test career here. Bhavin Shah: Broad gets the plaudits for Jo'burg but you can see that England really miss Finn. Need that hit the deck express bowler. Ellis: Shame no Footitt, variety in the attack very important in shorter formats, soon Tests? England caught behind a trend again? Amla is made to wait. Or rather, he chooses to wait as he's not drawn into the Anderson game of cat and mouse. A maiden. Real test of wills here. Amla on 99, Anderson bowling so far outside off stump that he'd need a broom to reach it. Three leaves. Interesting you should say that, Rob. Woakes has seven wickets in six Tests at an average heading towards 60. Jordan has 31 in eight Tests at an average of 36. The DJ plays Stayin' Alive. Aimed at England? "England have got to try and pull the run rate back, even if they're not taking wickets, just to create some pressure." Even when the England plan works, South Africa are the ones to benefit. Anderson drags Cook into a drive outside the off stump, but the batsman's feet are nowhere. He gets an inside edge, but the ball scoots past the diving Jonny Bairstow for four. Amla, meanwhile, moves to 98. "Alastair Cook is setting a field on the off side, saying to the bowler 'Bowl outside off stump for me', and the boundaries are coming on the leg side. It's very frustrating for a captain and at this rate England could be staring at 340 in a day." England pack the off side once more, but Woakes struggles with both the line and length. Ooooffff, a chance, but from another bad ball. Banged in, Amla hooks and cue-ends, almost to gully. Woakes ends the over with a leg-stump half-volley that Amla whips for four. There are seven men on the off side, two on the leg and Woakes bowls on the pads. No wonder Cook has his head in his hands. Village. Rob Hastings: Woakes is a classic example of a good quality county pro but one who's simply not good enough at the very highest level. Some make the transition seamlessly like Root whilst others have opportunities that they're not good enough to take. This an almighty mother's meeting between the England team. Five of them - Cook, Root, Broad, Anderson and Woakes, who he been entrusted with the ball once more. So far, he's bowled nine over 0-52. Bizarrely, there's a hospitality box at the ground that is being served by what can only be described as buff waiters. These chaps aren't wearing shirts, just waistcoats and bow ties.I'm told it's ladies' day at Centurion. Do ladies want buff men in only waistcoats? The sun pops out as Anderson explores the channel. Just a single from it. "If you're going to see one cricket shot this year, make it that Hashim Amla cover-drive. The weight, the timing, it was just an absolutely beautiful shot. That's a little highlight of the series for me." There's some buffet being served up now, this time in the shape of a Moeen full toss that Amla skims down the ground for four. It's hard to overstate just how easy batting looks at the moment. To prove the point, Amla laces yet another cover drive for four. The former skipper has now scored 51 runs through the covers. 51! James Anderson's familiar run-up kicks in to Amla, who is batting with the calm of a Zen master. No swing for Jimmy, no real inspiration from England. It's the Ashes at The Oval all over again. "It's the first time in this series I've watched England bowl and thought they don't seem to be bowling to a plan." Moeen after the break, but his beard looks to have fewer answers than Amla's. The former skipper has bullets in his bat, leaning in to a cover drive that scorches the turf despite Amla barely moving his bat. Meanwhile in Australia, Kevin Pietersen has blasted 62 off 36 balls to Melbourne Stars into the Big Bash final. KP hit five fours and two sixes in his innings as the Stars made light work of overhauling the Perth Scorchers' score of 139. The Stars - who also have former England batsman Luke Wright in the team - will play the Sydney Thunder in Sunday's final. David: Why do England persist with Chris Woakes? Never shown any ability to be a Test bowler. Mark: Would have preferred to see what Footitt could do in this game, we know what Woakes offers....sadly not a lot. Craig Moore: I thought everyone had already agreed Chris Woakes wasn't up to international standard? Surely Foottitt needed a go. James Anderson, not quite the Jimmy we're used to, is back. He and Alastair Cook have whipped up a plan for Amla, who has been intent of playing come cover drives. There are now two catchers on the off side. A 7-2 off-side field in total, so Anderson can't quite attack the stumps. A quiet over before drinks. "This pitch now looks incredibly benign, especially to the short ball." Tap, tap, lift, lift, shuffle, shuffle. Stephen Cook nudges anything remotely straight on the leg side. Whilst Cook accumulates, Amla is a highlight reel. This time he's snapping into a pull shot that rockets into the boundary. Ben Stokes, the bowler, might combust. You could fry an egg on his forehead. Hashim Amla has wrists of rubber. When Moeen is on the pads, Amla flicks it through mid-wicket in a whir of willow. He really does look in imperious touch. England have given him one life, remember. Could be very, very costly. "England are trying hard, but it's comfortable for the batsmen now. Stokes is the only one who's finding any swing through the air. You've got to get them early in these conditions." The first sound of the trumpeter today, our musician arriving with the Great Escape. England might yet need one of those. Stokes slips in with the traffic of Centurion off in the distance. Twice Stokes goes full and leggy who be worked by Cook, who gets the glare of the Durham man. Don't get angry, Ben. Get even. Ben in Southampton: Spent last night praying that Cook would get some runs in this test, but forget to let God know that I was talking about Alastair. Feeling guilty now. Moeen has been flirting with bowling round the wicket, but is over to Cook. Back round to Amla, possibly to stop him from shuffling across and using the spin. There's a degree of control from Moeen, but singles are on offer. "You can't see where a wicket is coming from. The bowlers can't do much with the ball. It's going to take a lot of character, quite a bit of discipline, bowling outside off stump." Stokes, a grimace through his ginger stubble, is getting the ball to swing, but it's too wide to tempt Cook to play. On the England bench, Steven Finn wears the shades of a man now on holiday. Cook, a heavy bat-tapping shuffler, jams down on one to get a single through square leg. Tracey Harris: Re. cricket related book. Try Cricket Kings by Wiliam MacInnes, it's nostalgic, whimsical but most of all laugh-out loud funny. Harry Mills: How about Hurricane Hamish? Story of a West Indian fast bowler found washed up on the beach in an MCC towel and plays barefoot. Spin, the return of Moeen Ali, England's only successful bowler today. Gloomy, but not chilly. No players in sweaters, spectators happy to bare some flesh. Amla is a man looking to cover drive anything that comes his way - blades flashing. Moeen is tighter, though. Two from it. Simon Goodall: Problem is that 150 will keep Bairstow in the team for the foreseeable future. He's not that great a keeper. Usman: Why does Bairstow always move to the left when the ball is pitched a foot outside off stump and edges go to the right? Chris Woakes, an economy rate of almost six an over, is withdrawn in favour of Ben Stokes, who himself serves up another half-volley for Cook to square drive for four. England desperately need something, anything. If it was football, they'd be begging for a goal off someone's backside. "It's clanger after clanger from Jonny Bairstow. He's making his brilliant scores lose some of their shine." England, being the astute professional cricketers than they are, have figured out that Stephen Cook likes the leg side. He's scored two third of his runs there. They post two catchers. However, that doesn't mean they should feed him. Any chance of some off-stump channel? When Broad fires one down past the hip of Amla, Bairstow appeals. Probably just celebrating not dropping it. "England have just got to try and bowl some dots. The rate is up at 4.2 and they've got to try and get it down. The way Woakes is bowling, he won't get a run in the side." Lots and lots going on here, more plotlines than an episode of 24. England seem to have a hangover, South Africa are resurgent. The Proteas have a number three batting beautifully after being freed from the captaincy and an opener making the most of a long overdue pitch. Stuart Broad still looks in a purple patch, James Anderson underdone and Chris Woakes not up to it. Meanwhile, off the pitch, I've discovered just how well-loved the Glory Gardens series was. A good day. "Hashim Amla likes batting at Centurion. He now has 995 runs at this ground at an average of 90.45, with four hundreds and five fifties." Oh, Hashim Amla. That is a seductive way to go to a half-century. Perfect cover drive, melted chocolate dripping off a spoon. And again! Someone tell Chris Woakes to stop bowling half-volleys. Amla is feeling it, Cook is making up for lost time and England are all over the shop. "Cook is the third South African opener since readmission to make a fifty on debut. The others were Andrew Hudson and Alviro Petersen, and they both went on to make hundreds." "What a way to bring up his 50, caressing the number one bowler in the world through the covers. 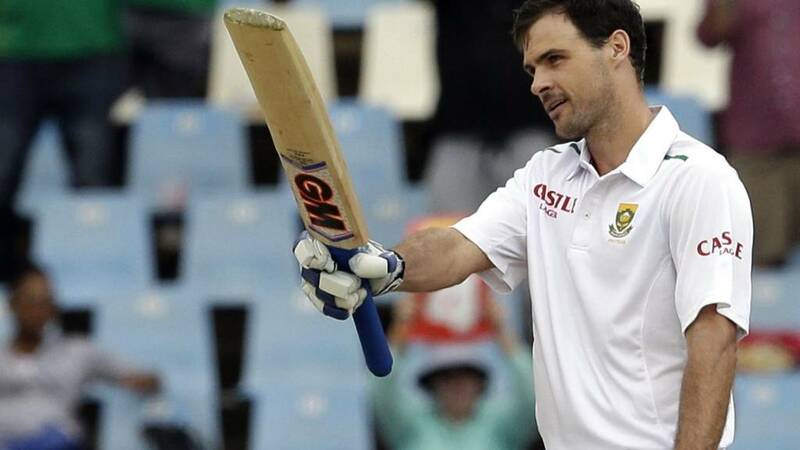 Stephen Cook looks like his game is suited to batting long periods of time, which is handy for Test matches. Anyone who watched his body language over the two hours of the morning session would have thought he'd played 50 Tests."